HIP DYSPLASIA WHAT YOU CAN DO TO HELP! MITRAL VALVE DISEASE is the most serious problem facing the Cavaler King Charles Spaniel today. Nearly 100% of all Cavaliers will develop MVD by age 10. MVD is a developmental fault involving the mitral valve of the heart. With each beat of the heart the four different valves open to let blood through at the right time and then close so that blood cannot flow backward. When a dog develops MVD, the collagen/connective tissue that makes up the mitral valve starts to break down and starts causing the mitral valve to not be able to close all the way. Blood leaks backwards and this *leakage* causes a sound that is called a murmur. Over time the mitral valve gets sloppier and more and more blood leaks backwards causing the murmur to get louder. The more blood that leaks backwards the harder the heart has to work to keep the blood moving so the body can get enough oxygen. The valve can get so sloppy that eventually the dog will go into congestive heart failure. At this point in time, medication is necessary to prolong the dog's life. Following are graphs showing the age of onset of first murmur that can be heard (the beginning of MVD) and percentage of affected Cavaliers from the United States and Great Britain. As you can see, there are no statistically significant differences between these countries. This is to show you CLEARLY that Cavaliers all over the world develop MVD at nearly the same ages and at nearly the same rates. Don't be fooled by those who tell you "their" line is free from MVD or "Irish, English or imported" Cavaliers are healthier than those elsewhere. This is simply NOT true! You now have proof--in the form of the graphs below--that MVD is just as prevalent in Great Britain (which includes Ireland) as in the United States. Despite MVD, the average lifespan is 10-11 years, and quite a few live 13-15 years. However, a certain percentage will not make it much past 7 or 8 years of age. Dr. Darke's early survey of heart murmurs in Cavaliers. The prevalence increases with increasing age. Over 30% of dogs 2-4 years old, 50% at age 5-6, and all dogs 11 years and older had heart murmurs. Beardow and Buchanan's study. 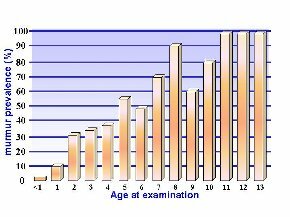 Age specific prevalence of left apical systolic murmurs grades 1-6 in 394 Cavaliers. The numbers above the columns represent the numbers of dogs in each group. The percentage of murmur positive dogs increases with age. Sweden did a study in 1993, showing that MVD is a multi-factoral polygenic trait. This means that genetic factors AND environmental factors (i.e. diet, environmental toxins/vaccinations, fitness of body--underweight or overweight) can contribute to how severely MVD will be expressed. The genetic component is QUITE strong. Puppies WILL, on average, tend to follow in their parent's footsteps as to when they will develop MVD, in fact this incidence is somewhere in the 86-88% range in just the first generation. This means that if both mom and dad are clear of MVD past age 5, about 86-88% of their offspring will still be clear of MVD at approximately age 5 as well. And this ALSO means that if both parents develop mitral valve disease BEFORE age 5, close to 86-88% of their offspring will ALSO develop MVD BEFORE age 5. BUT, approximately 10-15% of their offspring will not follow in their parents footsteps and may develop MVD earlier or later. Below is a graph showing the results of this study. 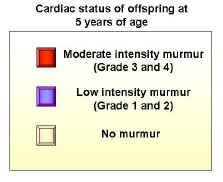 The chart on the left explains what intensity murmur each color represents. No murmur is what is hoped for. The higher the grade, the worse the murmur. 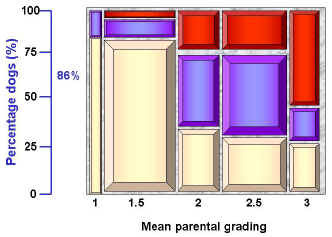 The chart on the right shows the comparison of the mean parental grading. *Mean parental grading* is the average of the murmurs of the two parents. If both parents were grade 1, then the mean parental quality would be 1 + 1 divided by 2 = 1. If one parent was a grade 1 and the other a grade 2 then 1 + 2 divided by 2 = 1.5. The graph clearly shows the parents that were most affected (had a higher grade MVD murmur) produced more affected offspring (by age 5) than did the parents less affected. in a way that puts emphasis on long-lived, delayed onset ancestors. This *cut-off point* of 5 years of age is only a first proposal. It is hoped that as the incidence of early-onset MVD improves, the cut-off age of 5 will be changed. 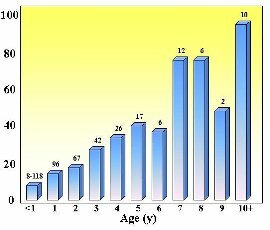 The cut-off age of 5 was chosen for two reasons: (1) Dogs that attain the age of 5 still free of MVD are already in the upper 50th percentile--or are in the *better half*, the half which we WANT to use in our breeding programs. (2) Since the gene pool for the Cavalier is small, eliminating only the *worst* half of the population will still allow us to maintain a decent-sized gene pool and progress slowly towards a later and later onset of MVD. Although the protocol is voluntary, it is hoped that as time goes by, more and more breeders will be able to follow this protocol. BEFORE you buy a puppy from ANY breeder, please ask for copies of the current cardiologist heart clearances of BOTH parents. Because MVD is a developmental fault, it simply canNOT be checked for in a puppy. It is the parents that need the clearance form. Look any forms you receive over well. Virtually all of them, even if they vary from the examples shown, will state the name of the dog that was examined, the date of examination somewhere on the form and clearly state the name of the Board CERTIFIED veterinary cardiologist. Please look for these specifics. A vet signed statement is NOT acceptable. The vast majority of veterinarians CANNOT hear low grade murmurs (grades 1 and 2), so ONLY Board Certified Cardiologist clearances are acceptable. For more on MVD, please go to this site: www.ckcsc.org. This is the Cavalier King Charles Spaniel Club, USA, Inc., site. Click on Health and then MVD to read more. You can also view and/or download the Transcript from the Atlanta Heart Symposium in 1998, which presented the Swedish study and proposed the heart protocol, at the CKCSC site also. 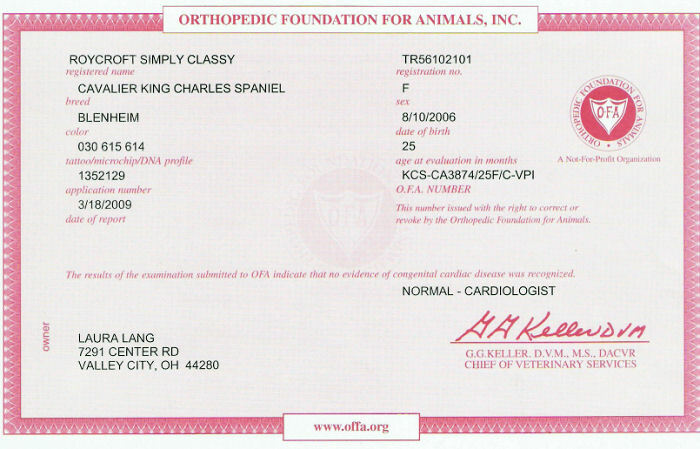 On cardiologist clearances it is important to note: (1) The name of the dog listed on the certificate to be sure it matches the name of a parent of a prospective puppy. (2) The date of the examination. (3) The date of birth of the dog that was examined--please cross check the date of birth and the date of examination to figure out the age of the dog at the time of the examination. (4) The name of the cardiologist who did the examination. The following are some samples of acceptable cardiologist heart clearance forms. Please click on the picture to see a larger version of the form. 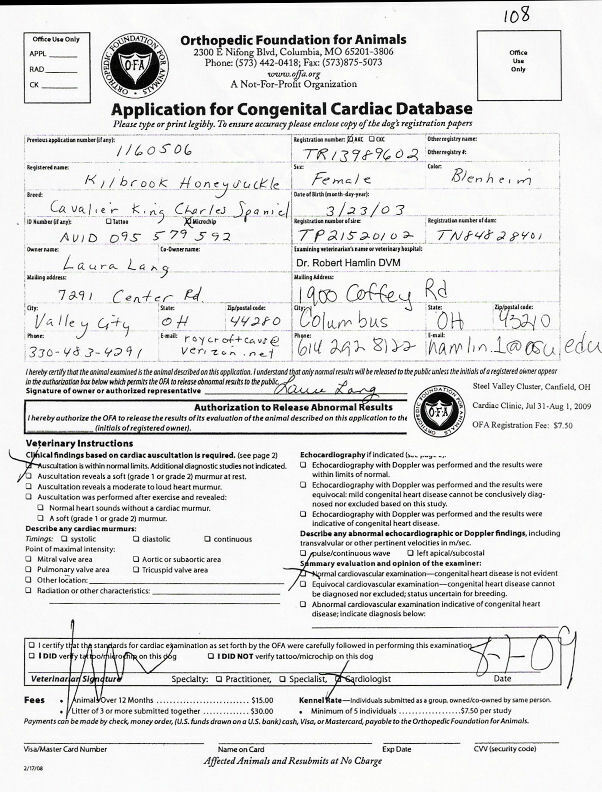 Below is the OFA Application the Cardiologist fills out to send to the OFA for certification. Last is a copy of the *official* OFA cardiac clearance form which a breeder receives after sending in the Application form. When looking at this form, be sure to note whether or not there is a letter "C" right after the last slash in the OFA Registration Number. The letter *C* indicates that the heart auscultation was done by a board certified cardiologist. If there is no *C*--the certificate is not acceptable.